Just as their USDA Prime beef gets better with age, they owe our reputation as the premier provider of gourmet steaks to the test of time. From the day Bernhard Pollack founded Stock Yards Packing Company in the stock yards area of Chicago in 1893, they were clearly focused on providing the highest-quality products with unparalleled service and utmost integrity. 1893: Stock Yards Packing Company is founded by Bernhard Pollack as a retail butcher shop in Chicago. 1902: Gus Pollack takes over and concentrates on the wholesale side of the business. 1939: Gus's son, Bernie Pollack, extends sales to Wisconsin and Michigan. 1948: The company begins shipping meat in barrels packed with dry ice. 1964: With new USDA grading requirements, Stock Yards has its beef cut in separate rooms. 1970: A permanent facility is opened in Las Vegas. 1982: A cooler-freezer distribution center is built in Atlantic City, New Jersey. 1990s:Stock Yards cultivates business in the Caribbean, Mexico, and Asia. 2000: Stock Yards is sold to U.S. Foodservice, a national food distribution company. Stock Yards Packing Co., Inc. is one of the largest suppliers of choice and prime cuts of beef to restaurants, resorts, hotels, and private clubs. 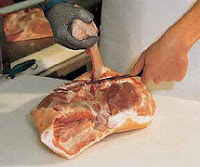 The company also supplies lamb, poultry, pork, and deserts in the United States and worldwide. Through the years, Stock Yards has pioneered such distribution concepts as shipping by train, offering meat as specified by the customer, offering hand-cut individual portions, and vacuum-packing. The largest concentration of customers are in Chicago, Las Vegas, and Atlantic City, but the company supplies meats to the world market and to individual customers via mail order and the Internet. Owned by the Pollack family for five generations, the company was sold to U.S. Foodservice in 2000. In the early 1890s, Chicago was known throughout the United States, and the world, as the butcher capital. In 1893, Bernhard Pollack opened a retail butcher shop on Halstead Street. He took inspiration for the stock yards of the area to name his shop Stock Yards Packing Company. With his son, Gus, as an assistant, Pollack expanded the business to include the wholesale markets of restaurants, hotels, and clubs. Gus took over the company in 1902 and moved the shop to Wells Street as business increased. The younger Pollack felt the potential from wholesale business was so great that when he moved the company, he discontinued the retail portion of the business. Just as World War II was breaking out, Gus's son Bernie joined Stock Yards in 1939. Father and son moved the company yet again, to the Fulton Market area of Chicago. The war years were difficult for Stock Yards, as the U.S. government instituted rationing. During those years, the company covered the display windows of the coolers with paper, so people in the streets could not see the large quantities of meat that, because of rationing, the company would be unable to sell them. The end of World War II saw the push for Stock Yards to become a national company. 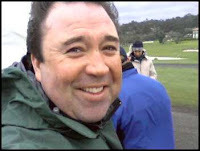 Bernie Pollack headed the company and brought on his two brothers-in law, Harry Katz and Stanley Katz. With each man overseeing his specialty--Bernie administration and sales; Harry merchandising and sales; and Stanley, purchasing and production-the company's sales outside of the Chicago area began to grow. Harry Katz began to drive throughout the Midwest, Texas, and Oklahoma, visiting restaurants, clubs, and hotels to push for business. Many customers were gained with the company's promise to deliver meat that met the customers' selection for specifications and aging. In fact, Stock Yards was one of the first meat companies to allow customers to order specific grades and cuts of meat. Stock Yards shipped its orders outside the Chicago-metro area in wooden barrels and 'church containers' packed with dry ice. In the early 1950s, Stock Yards continued to look for new and innovative ways to provide customer service. The company hired sales people outside of the Chicago area--first in Texas and Louisiana--so they could offer hands-on service for customers. Stock Yards began shipping customers individual portion-sized cuts of their meats at this time, again becoming one of the first companies to do so. When the USDA designated grades of meats and required that they be cut in separate rooms during this time, Stock Yards designed two different rooms at their facilities, for U.S. Choice and U.S. Prime, and became one of the first companies to win approval from the USDA for such labeling. Pushing westward, Harry Katz made some sales trips to Las Vegas. After World War II, the tourism industry in Las Vegas grew rapidly, and the city became that area's largest employer. The postwar period saw immense growth in the hotel industry, as casinos were built and resorts and restaurants sprang up to accommodate out-of-town visitors. The tremendous growth in the Las Vegas market soon resulted in Stock Yards sending refrigerated trucks to the area twice a week. Over the next two decades, business grew at such a rapid clip that Stock Yards built its first non-Chicago area distribution facility in Las Vegas in 1970. Due to growth in the late 1940s and early 1950s, and with an eye towards future growth, Stanley Katz located and purchased a new site for Stock Yards in 1953. Located three miles from the Fulton Market area, the Oakley Boulevard headquarters would continue in use through the 1990s. Originally encompassing some 30,000 square feet, the new site was the first meat packing plant designed specifically for customers in the hotel, restaurant, and resort business. Through the 1970s, several expansions were made to the plant, the first being a 10,000-square-foot addition in 1960, which was used for coolers that dried aged beef. Demand for dried aged beef fell during the 1980s, and the coolers were converted to cryovac age beef. The last addition to the Stock Yards plant was in 1978, bringing total freezer, storage, and office space to 60,000 square feet. In 1965 the fourth generation of Pollacks joined the company. Bernie's son, Dan, first spent ten years working in all departments, learning every aspect of the business. He then concentrated on sales, working under Stanley Katz. Recalling the boon the casino resorts in Las Vegas had been to the company, Dan Pollack made sales trips to the Atlantic City, New Jersey, casinos in the early 1980s. By the end of 1982, business in Atlantic City had grown to the point that Stock Yards built a distribution center in the area. The fifth generation of Pollacks came on board in 1994. Dan Pollack's son, Matthew, joined the company after a brief stint working for an insurance company after college. By 1997, at age 27, Matthew took over from his father the running the company's day-to-day operations. 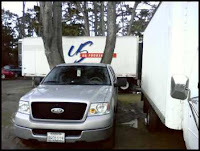 In February 2000, Stock Yards Packing was sold to U.S. Foodservice, one of the largest food distributors in the United States. Brandywine-A pink, potato-leaf, Amish variety from the 1880’s. Produces in about 80 days, Big and Beefy with sweet flavor, very juicy. Alicante-Produces early, usually in 68 days or so. A good round slicing tomato without many blemishes. Sasha Altai-Hearty plant produces good yields of 4-6 oz. 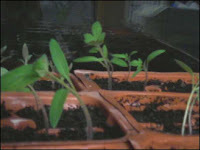 bright-red, round tomatoes in about 60 days. This was a high altitude Russian variety tomato that sets well in coastal climates. Isis Candy Cherry-Sweet as candy round cherry tomatoes that produce 1½" fruits. Not a terrific producer last year in my garden. So I've moved it to my labor intensive planter box along a warm fence. San Marzano-Compared to the Roma Tomatoes, Marzano tomatoes are thinner and pointier in shape. This is a mid to late producer that will begin fruiting in about 80 days. this was a fantastic producer up on the sandy hillside in stark contrast to the Candy's. I filled in with some transplanted seedlings including the Tatsoi shown above. 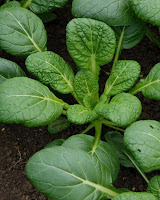 This is alot like Bok Choy and can be used in braises as a substitute, but is also fantastic in tossed green salads. 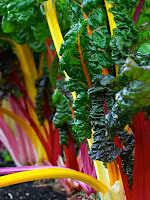 Another fun one I picked up from Valley Hills Nursery was the Bright Lights Colorful Chard. 'Bright Lights' swiss chard was chosen as an All-America Selection Winner in 1998 and is also the recipient of the Royal Horticultural Society's Award of Garden Merit. I finished off with some basil, parsley, mixed lettuces, and a six pack of cabbage to complete this garden area. All before the fog rolled in around 3ish. Cole slaw, literally translated, means cabbage salad. The English adapted the word from the Dutch word koolsla. Both the English ‘cole’ and the Dutch ‘kool’ come from the Latin ‘caulis,’ which means cabbage. Currently we have a stable lettuce market. Very light production is expected to continue in Yuma until mid-April due to some late plantings. Most shippers either have or will make the move to Huron this week. Many suppliers have enough volume to cover orders in full. Quality and volume should be average with most suppliers throughout the week. This market is steady with plenty of supplies from most shippers. It would be a good decision to switch to naked leaf to avoid the dehydration of the liner product. Most shippers continue to be ahead of their projected harvesting times on the leaf fields, leaving plenty of product to go around and shippers hungry to deal. Some quality defects continue to include fringe burn, tip burn, and wind burn. Pricing is extremely volatile on bunched broccoli crowns right now. Yuma is winding down, and both Salinas and Santa Maria have experienced very cold night time temperatures these past few weeks. And what product is growing is very branchy, and not suitable for crown usage. Pricing will be very active all week. The production on bunched broccoli has become much tighter compared to the previous week. Mexico and Florida continue to provide an option for broccoli crowns. As with broccoli, the cauliflower market is also much tighter with all suppliers. Salinas has started some early production. Expect this commodity to be active throughout this week as most suppliers begin to finish up the season in Yuma. Demand is definitely stronger. Some defects showing up include black spotting and yellowing upon arrivals. Harvesting has started in new fields in the Imperial Valley. Size is running small right now as cool weather has slowed growth. This has lightened supplies of jumbo sized carrots. Size is expected to improve in about 2 weeks. Quality remains good. Georgia has good availability and quality on the East Coast. This market continues to be steady with most suppliers. Yuma has very light production with the lion’s share of the product being harvested in Oxnard. Sizing is heavy to the larger product, 36’s and smaller are the tightest sizes to purchase. The Salinas valley expects to begin production in the early part of June. Florida is expected to have celery until around mid April. Strawberries Strawberry production this week has started with mixed reports out of California. A cold front accompanied with some minor rain showers did not affected production greatly but the cooler temps are keeping production a bit lower than expected. The market is expecting a mid week drop as shippers are expecting much better volume coming in. Florida is starting to wind down in various stages with production. McAllen is completely finished with strawberries. Raspberry production continues tight this week due to diminished transfers from Chile and Mexico. There has been some local California production, but with the past and current light rain patterns, the numbers have fallen greatly, and quality has been affected. We can expect tight supplies until Northern and Southern California kick in. Blackberry supplies are steady with greater consistency in transfers arriving from Mexico. We are now looking for local California production to come into play. Some shippers are offering aggressive pricing anticipating a big push over the next couple of months. Quantities on blueberry transfers from Chile are dwindling down, mostly air freight from this point forward. Shippers are seeking higher fobs. There are small quantities of local Californian blues with great size and quality. We may see a gap as the eastern early varieties where affected by early frost damage. As we have reported all along, this years Burbank variety is largely to the smaller profiles in size and more #1 product. As a result large potatoes ( 70 ct & up ) have recently become snug as well as 10 oz #2’s. Wisconsin and Colorado still have good supplies and quality. Colored potatoes are loading out of North Dakota and Wisconsin with Washington cleaning up for the season. California has good quality and supplies of colored potatoes. Florida is also now up and going with good quality. There are still good supplies of all colors and sizes of onions in Idaho and Washington. Some shippers are starting to close down for the season but we expect Idaho will have product available through the end of April. Mexican product is now in Texas with good supplies of all colors, quality is good. Load volume deals are still available. Texas grown onions are starting to become available, at this time it looks like sizing is running jumbo and smaller. There are deals available on smaller apples, and lower grades in most all varieties. Remember, lower grade is not necessarily lower quality, just less than full color. Washington remains the leading production area for apples and will be through the spring and summer months. Regional production areas including Michigan and New York continue shipping light supplies of storage apples; demand remains light for those. Washington and Oregon Pears continue production from storage including mainly the Anjou, Bosc and Golden Bosc varieties. Pineapple demand has been very good—as supplies are below forecast due to adverse weather in Central America. Quality is good to very good. Mexican fruit – Mexican shipments are steady, with steady markets, and good demand. Chilean Fruit - Chilean season is coming to the end. Supplies are still trickling in, but this is the end of it. California Fruit - Growers are harvesting limited volume, but look to ramp up production as we move through March and into April. Valencia’s are going strong, and more to the large size. We are seeing very few 100s and 125s. Quality is excellent, and should be available through May. Spring Navels will continue through April. Grapefruit will begin to wrap up in about another week. Honey Tangerines are finishing this week. There will be good supplies of Navels available into May. Peak sizes are 48’s through 88’s. There is limited harvest starting on Valencia’s. The overall quality is excellent and fruit is eating very well. We are harvesting all gibbed fruit that will have a tinge of green on the blossom and stem end. Expect the market to stay steady for the next few weeks and then it should start to strengthen up. The Coachella and Yuma areas are 100% picked and the Central Valley is 70% picked. Most of the volume is coming out of Ventura County. Supplies are peaking on 140’s. There are good supplies of 165’s, with 200’s being a little on the tight side. Market is steady on the larger sizes and stronger on the smaller sizes. The overall quality is very good with excellent color and very good juice content. The market is steady with supplies of green seedless far outweighing supplies of the reds. We are currently finishing up on the flames and are now seeing some crimsons which will be the final red variety that will get us through until we start harvesting Mexican and California fruit around the first of May. The overall quality is excellent and fruit is eating very well. We expect the market on greens to hold steady and the red market to strengthen as we forward. Cantaloupes and Honeydews are in the same market conditions. Honduras and Costa Rica supplies are dwindling and Guatemala is coming into the second cycle. The fruit is cutting well and fruit is eating fair to good. Expect the market to keep steady through the month and then we should see the market strengthen until we start our California fruit around the first week of May. Watermelon supplies in both the seeded and seedless are extremely light again this week. Transition back to Northern Mexico is a difficult one and growers continue to struggle with weather and growth patterns. Demand is strong for limited supplies and the market will remain strong. Although there are light supplies, the quality is still very good. Honduras is finishing up and South Florida is still a good 2-3 weeks away from any ample supplies, the cucumber market is at the highest it has been in quite some time. Quality issues are rampant in the final off shore shipments while the beginnings of the domestic supplies are undersized and scarred. Scarce supplies and a screaming market will be the go for the next two weeks. Western Cucumber: Production has dropped this week from Mexico as southern growers come to the end of their fields, and what volume they are sending is heavier to off grades. Expect supplies and qualities to improve in the month of April. The market on bell peppers continues a steady decline as more volume becomes available in Florida. Rain earlier this week did not impact the market. The market should continue a steady drop through the week and then begin an upward trend in another 7-10 days as growing areas change again. Still very light supplies of green bells coming out of Mexico as volume continues to drop off, with size and quality being a problem. The California desert looks to start the 3rd week of April. Demand is very good. Red and yellow bell supplies remain light. The squash market is starting making a dramatic downward turn after weeks at the higher levels. Plenty of warm, sunny weather has brought on good supplies, and improvements in quality. The market should continue to drop but in smaller increments, as Plant City begins to produce good volume in another 10-14days. Nogales supplies of squash are still light this week, but looks to start coming back next week. Demand is improving, and looks to return to normal in about 2 weeks. East – Tomato production in Florida is lower than Mexico but demand is keeping the playing field level. Cooler weather is slowing production and growth, and higher markets are being tested with daily pricing. West – Mexican growers have pulled back a bit on production to get themselves out of the low market they have been in for a month. There is still plenty of vine ripe fruit to go around but we are seeing a bit higher fobs for gas green round tomatoes. Roma tomatoes are reacting a bit with quality being a big concern. REGISTER AT LEAST ONE WEEK IN ADVANCE OF THE SERVSAFE CLASS!!! Your Registration is Confirmed When the Registration Form & Payment Have Been Received. Check out the latest commodity market update for March 19th right here. U.S. Foodservice has a valuable asset in their local sales demon, Brian Isaeff. This guy is the epitome of what a good sales rep should be – cheerful, patient, funny, patient, smart, patient, knows-his-products, patient and did I mention…patient? U.S. Foodservice and their point man, Brian, are the logistics wizards behind keeping all of those folks who come here for the AT&T, The Concours and the upcoming Pebble Beach Food and Wine Event (April 16-19, tickets on sale now www.pebblebeach foodandwine.com) supplied with whatever they need whenever they need it. 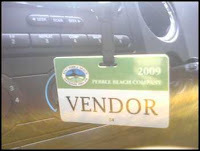 You may have seen the rows of U.S. Foodservice’s large refrigerated trailers parked on the outskirts of these events. Take a closer look and you’ll see good ol’ Brian running around doing an impression of some of the headless poultry he sells, with a cell phone, walkie-talkie and Blackberry dangling off of every limb of his body. While Brian might occasionally misplace a thing or two from an order of a thousand different items, he never forgets his patient smile and who his customers are. 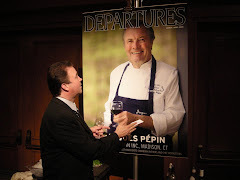 Kudos to U.S. Foodservice for the outstanding level of service they afford these large events that in turn, give so much to local charities on a yearly basis. It takes all of us working in concert to make these events and the charitable income they generate happen. It wouldn’t be possible and it certainly wouldn’t be nearly as pleasant without folks like Brian Isaeff . I've been trying to fit in time here and there to get the garden ready for production. 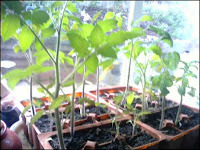 In early February I got the tomatoes planted in cell packs on the kitchen window. Right after that I prepared 4 raised planters to grow some root crops. I have carrots, 2 candy and golden beets, and some green onions going already in those planters out doors. 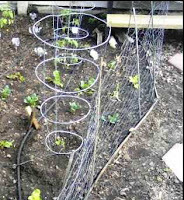 I've discovered that the birds favorite is carrot seedlings from a raised bed planter in Brian's Backyard, right after that is candy stripe beets, and then goldens. They do not, however like bunching green onions. Next round I'm planting green onions in every planter as a deterent. Or if that doesn't help I'll have to string fabric over them. 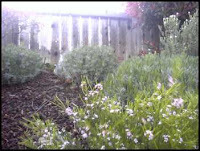 Some of my gardens from the past are helping out and are returning on their own like my thyme (which really goes year round), oregano,tarragon, and lavender. 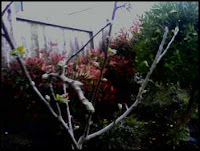 The 4 in 1 apple tree is starting to bud in all directions too. I did some work on the tomato beds turning and amending, and finally made some irrigation changes that needed to be done. This year I'm sticking to 3 tomato varieties that will cover immediate use as well as canned sauces, pastes, and juices. Brandywine heirloom tomato is Probably the first heirloom to achieve "cult status" within the growing popularity of heirloom tomatoes. A pink, potato-leaf, Amish variety from the 1880’s. 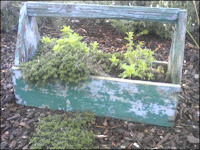 Years ago, seed saving was done by individuals who understood that the greatest thing they could pass on to the next generation was some of the treasured food plants that had sustained life and had proven their value. One such pioneer was a man named Ben Quinsenbury, who lived in Vermont. He died at the age of 95, passing on his legacy. The Brandywine was Ben’s favorite tomato. Gary Ibsen, founder of the TomatoFest and the Tomato Seed Store says "In years of my holding tomato tastings for chefs and tomato lovers, the Brandywine has always placed as one of the top three favorites." It is legendary for it’s exceptionally rich, succulent tomato flavor. Fruits are reddish-pink, with light, creamy flesh that average 12 ounces but can grow to 2 pounds. By far the best producing tomato from last year that is back in the garden this year is the San Marzano. From Italy. Compact and prolicic producer of bright-red, slim, 2-3 inch, plum-type, fruit over a long season. A paste tomato with pointy end, heavy walls and little juice, so it's great for tomato sauce. Crack resistant. Better tasting than Roma. Canned tomatoes and sauce from this one lasted for months. Sasha Altai is an excellent variety from Russia. Hearty plant produces good yields of 4-6 oz. bright-red, round tomatoes. Tomatoes are very flavorful. Excellent for canning, salads and making tomato juice. Fruit sets well in cooler coastal climates. Last year I picked up some peppers, sweet peas, and snap peas for late in the season and I will probably do that again this year, however Park Seeds has my email address and are sending weekly blasts on different items. Out of their latest email I think I'm going to pick up a pepper and a pea because they sound fun and different. 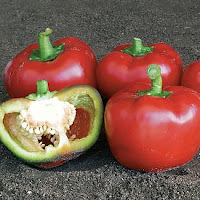 Pepper Topepo Rosso Hybrid (Capsicum annuum Topepo Rosso Hybrid)Thick walled (1/2-inch! ), juicy, and peppery-sweet, this update of a classic northern Italian variety is one of the most versatile and delicious sweet peppers around. The fruit is 3 1/2 to 5 ounces, red on the outside (if you allow it to ripen fully; it can also be picked green) and green within. Perfect for stuffing or slicing into rings for a salad or garnish, it holds its shape nicely, and has a nice blend of juices and solids. This is a meaty pepper, giving you an extra bite of rich flavor in every fruit. The plant is robust and very heavy bearing as well. With large foliage providing good scald coverage for the ripening fruit, it sets big crops of tasty peppers. Use Topepo Rosso for fresh eating, cooking, or canning. Pea Blondie(Pisum sativum Blondie) This cream-colored beauty tastes as good as it looks, and it's certain to be the pea of choice for gardeners this season. Every bit as sweet, succulent, and delicious as its plain old green cousins, it defines "plate appeal," and gives parents and grandparents a sneaky new strategy for getting kids who hate green vegetables to eat their peas! Blondie sets creamy pods, blunt ended and about 3 1/2 inches long, in large clusters on very vigorous vining plants. 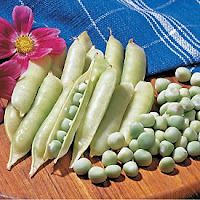 Each pod contains 8 to 9 fat, tender peas. Eat them fresh or lightly steam them -- the flavor is so rich and full, you won't want to tamper with it by too much cooking! Our award winning Chef, Jerry Regester is adding some new comforting menu specials as additions to our extraordinary menu. We also offer complimentary parking when dining at the C which you’ll find comforting as well. Join us for Happy Hour in the C restaurant + bar Sunday through Thursday from 4 – 7 p.m. and enjoy ½ price on beer, wine and small plates. FORWARD ON TO ALL OF YOUR LOCAL FRIENDS AND FAMILY!! An ancient strain of cultivated wheat, best described as the heirloom version of spelt. A first class grain measuring 6 to 8 mm long and slightly pearled to eliminate the need for soaking. Makes a great risotto! 216 Servings per 24lb. case. Ingredients: Farro. Product of Italy. Preparation and Cooking Instructions: Stove Top: Bring 2 quarts water or stock to a boil. Add 2 lb. sleeve of Farro, Indian Harvest (4 oz.) seasoning packet (optional) and stir. Cover tightly, return to boil, reduce heat and simmer. Cook for 25-30 minutes, until rice is tender and most grains are slightly split. Drain excess liquid if necessary. 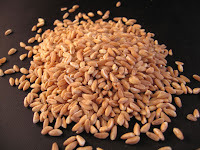 Farro may be cooled down by rinsing in cold water. Hold in steam table for serving or chill for later service. Reheat by sautéing with any of your favorite herbs, spices and vegetables. Yield: 9 cups. Heat olive oil in large pot and add onion. Sauté until onion is translucent. Add Farro and continue to stir. Once Farro is mixed well, add white wine while stirring. Add stock one cup at a time while continuing to stir until all stock is gone. In a separate pan, heat olive oil before adding vegetables. Add asparagus and mushrooms and sauté until almost tender - add more olive oil if necessary. Next, add zucchini and squash and sauté until slightly tender. Lastly, add tomatoes and sauté until heated through. Stir Parmesan cheese into Farro and mix well. Stir in vegetables and serve. Garnish with grated parmesan and chopped parsley. Restaurant operators in California are gearing up for what some have dubbed “Foam Fight 2009,” as law-makers consider legislation that could make California the first state to ban the use of polystyrene foam and nonrecyclable disposable foodservice containers. Polystyrene foam is a plastic commonly known by the brand name Styrofoam, one of the most inexpensive food container materials available. Expanded polystyrene can be used to make clear plastic containers. Environmental activists, however, argue that such nonbiodegradable plastic is a leading cause of pollution in oceans and inland waterways and may have a toxic effect on both marine life and humans. More than 30 mostly coastal cities and counties in California have enacted comprehensive or partial bans on the use of polystyrene products by restaurants, and another seven are considering similar restrictions. Outside California, bans are in place in the cities of Seattle and Portland, Ore., as well as Rahway, N.J.; Freeport, Maine; and Suffolk County, N.Y., according to California Clean Water Action. New state legislation proposed Feb. 27 by Reps. Jerry Hill, D-San Mateo, and Petro Nava, D-Santa Barbara, would ban the use of polystyrene foam or expanded polystyrene foodservice products statewide, as well as prohibit the use of any nonrecyclable plastic food container or nonrecycled paper container. Restaurant operators say they would love to use more “green” alternatives for disposable ware. The problem, however, is that such products are significantly more expensive than polystyrene-based options. A mandate to use green products, they say, would force restaurants to raise menu prices at a time when consumers are holding tight to their wallets—a dangerous move in today’s economy. Many also contend that some compostable and biodegradeable products have a tendency to melt when exposed to hot foods, and they worry that they will be forced to pay more for recyclable products that will end up in landfills because consumers don’t recycle them. A statewide ban on polystyrene foam foodservice ware has been proposed in California in the past and failed. However, because so many local jurisdictions have adopted such bans, including the cities of Monterey and San Bruno just last month, observers say support has grown for state-level action. Supporters say a statewide ban would create an immediate market for green disposables, which would potentially bring the cost of such products down. Manufacturers of both polystyrene and recyclable and biodegradable products, however, disagree. Nationally, demand is softening for Solo’s greener products, largely because of economic pressures, he said. Green alternatives typically are priced about 5 percent to 40 percent more than more affordable options. Burbank, Calif.—As of October 14, 2008, Council is considering ban on Styrofoam. Long Beach, Calif.—As of April 2008, proposing to ban EPS at city facilities. 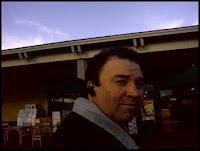 Los Angeles County, Calif.—As of June 2008, proposes EPS ban at all county facilities in phase I and investigating feasibility of expanding ban to all retailers for phase 2. Riverbank, Calif. (Stanislaus County)—As of October 2008, proposing to ban all Styrofoam takeout containers at fast-food restaurants. Marina, Calif. (Monterey County)—New Green Party mayor is proposing a ban on polystyrene. Blend together all ingredients except chicken. Place chicken in bowls or pans; pour honey mixture over chicken, turning to coat. Cover and refrigerate at least 2 hours; drain. Spray or line baking trays. Arrange chicken on trays. Bake at 350°F 20 minutes. Turn chicken over. Bake additional 15 to 20 minutes. Spring Fling. Balmy weather, spring flowers and the buzz of busy honey bees invite the return to outdoor activities. Observe National Nutrition Month with a "Power Bar" to fuel emancipated bicyclists, joggers and softball enthusiasts. Start your display with fresh yogurts and granola. Follow with high power toppings such as honey, dried fruits, wheat germ, toasted seeds and nuts. Finish with a station offering honey-sweetened fruit smoothies. Sweet St. Pat's. Sweeten St. Patrick's Day sales with honey. Offer honey kissed Irish soda bread. A sure and simple honey glaze is the perfect finishing touch on any sweet dough or bread item. Is Kindai The Sustainable Answer To Tuna? For years sushi aficionados have reserved their most lavish praise -- and their spare cash -- for bluefin tuna, the fatty, pinkish fish featured at high-end restaurants across the globe. But as wild stocks of the fish have plummeted, ordering bluefin has become as socially unacceptable as consuming the once-ubiquitous Chilean sea bass. Now, Virginia's Monterey Bay Fish Grotto restaurant has joined a small group of U.S. restaurants selling a bluefin tuna dubbed Kindai, farmed from hatched eggs in Japan as the result of a university laboratory's efforts to ease diners' consciences. Though the product is not fully sustainable, it underscores how fish suppliers and academic innovators are seeking to satisfy consumer demand without wiping out wild populations altogether. Jimmy Carter occupied the White House. Everybody was listening to the Village People's megahit "YMCA," and Paul Prudhomme opened his K-Paul's Louisiana Kitchen in New Orleans and popularized blackened catfish. That year, 1979, also saw the usual opening of dozens of restaurants in San Francisco, most long gone and forgotten - except for at least three oases of fine dining that not only survived some harrowing times (the Loma Prieta earthquake, 9/11, the dot-com bust), but have become icons in an urban food scene studded with stars. At first glance, the three seem vastly different - Green's, possibly the nation's most celebrated vegetarian venue; Zuni Cafe, the eclectic gathering place of artists, writers, culinary professionals and politicians; and Hayes Street Grill, mecca for local politicos, patrons of the performing arts and lovers of fresh, unadulterated seafood. But scratch the surface and find that these three have much in common. First and foremost, all are dedicated to the best local provender. Second, all three have kept their focus over the decades, never trying to be hot or trendy. Read the SF Gate story here. Give me a cheeseburger, some jalapeno poppers and a bag of cocaine, please. Police padlocked a T.G.I. Friday's in the Financial District after the eatery's workers allegedly turned a blind eye to drug dealing at their bar for at least seven years. Many of the drug buyers were Wall Street traders, brokers and bankers who liked to spend their nights getting high after the market spent the day going low. "It was common knowledge that after work, if you needed martinis, mozzarella sticks or marijuana, this was the place to go," a source told The Post. "It's the place with the three M's." Once upon a time, pork was America’s favorite meat. From Colonial times until the 1950s, pork was the mainstay of the American diet, outselling both beef and chicken decade after decade. From the 1950s through the 70s, pork consumption decreased steadily and the diet craze that began in the 1980s sent the industry into a tailspin. As chicken became America’s favorite meat, pork producers responded by promoting pork as “the other white meat” and switched from raising tender, tasty farmstead hogs to producing pork with as much as 30% less fat. The reduction in fat cut a few calories, but it robbed the pork of intramuscular marbling ~ where the flavor and juiciness reside. The end result was pork that was tasteless and dry. Not the best incentive to buy a package of pork chops or a pork roast for Sunday dinner. Fortunately for those of us who long for the taste of old-fashioned, homegrown pork, one group of producers held fast and maintained the original, delectable taste of pork: the producers of Berkshire pork. Research has shown that Berkshire pork not only has finer marbling but also shorter muscle fibers (translates into more tender meat). A University of Iowa taste test Berkshire pork ranked first in 22 out of 24 traits that influence tenderness, meaning the Berkshire is genetically predisposed to producing the finest quality pork. Up to now, the major market for Berkshire pork was not the US but Japan, where taste took priority over fat content. In Japan Berkshire pork is called Kurobuta (Black Hog) and is prized as much as Kobe beef, but now, chefs at upscale restaurants in the United States have “discovered” Berkshire pork and it is an centerpiece item on their menus. 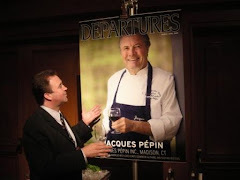 "It's a great, versatile product," said Tom Boyce, chef de cuisine at Spago, in Beverly Hills in California. "... It's definitely one of our favorite things to cook out here. It's God's favorite animal as far as I'm concerned." The noted Chicago eatery Blackbird has kimchi on the menu, and California Pizza Kitchen is developing Korean barbecue beef pizza. In Los Angeles, crowds are lining up for street food from a pair of Korean taco trucks called Kogi. The slightly sour-tasting Korean frozen yogurt served at the Pinkberry and Red Mango chains has inspired many imitators. Redolent with garlic, sesame oil and red chili peppers, Korean food is suddenly everywhere. It's even on the packaged-food industry's radar. "Last year, mostly what we saw in our database was Korean food at authentic ethnic places," says Cindy Ayers, vice president of Campbell's Kitchen, which tracks trends for new-product development at Campbell Soup Co. This year, she says, she's seen Korean flavors appearing on both high-end menus and in casual, nonethnic restaurants in cities like Minneapolis and Des Moines, Iowa -- a sign Korean is starting to catch on. Speck is a distinctively juniper-flavored ham originally from Tyrol, a historical region that since 1918 partially lies in Austria and partially in Italy. Speck's origins at the intersection of two culinary worlds is reflected in its synthesis of Italian salt-curing and central European smoking. 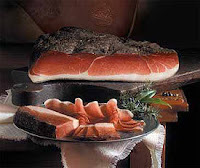 The first historical mention of Speck dell'Alto Adige was in the early 1300s when some of the current production techniques were already in use. "Speck dell'Alto Adige (Südtiroler Speck)" is now a protected geographic designation with PGI status. Like prosciutto and other hams, speck is made from the hind leg of the pig, but, unlike other prosciutti, speck is boned before curing. 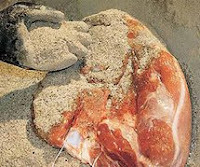 A leg of pork is deboned and divided into large sections called "baffe", and then cured in salt and various spice combination which may include garlic, bay leaves, juniper berries, nutmeg and other spices, and then rested for a period of several weeks. After this the smoking process begins. Speck is cold-smoked slowly and intermittently for two or three hours a day for a period of roughly a week using woods such as beech at temperatures that never exceed 20°C (68°F). The speck is then matured for five months. The production process of Speck Alto Adige cannot depart from the approved method that complies with the guidelines filed in Brussels for the Protected Geographical Indication. If the salt exceeds 5% in the final product, the speck cannot be sold as Speck Alto Adige. The most important element in a superior speck is the choice of the raw ingredients, followed by the seal showing the date of production, and the blend of spices. In a process that must follow strict guidelines, each individual producer can personalize his product in the flavoring phase, deciding what spices to use according to secret recipes handed down through the generations. The flavor is also influenced by the corning and smoking, which is done using low-resin wood at a smoke temperature of 20°C. Only fire-branded speck is PGI Speck Alto Adige. The hams are then aged and periodically exposed to the bracing air of the South Tyrol valleys, giving the speck a particularly light and mildly smoky flavor. Ageing is done in special areas, kept under strict temperature and humidity controls. An effective control system ensures that the EN45011 regulations set forth by the European Union are scrupulously followed. From the Mario Batali Website try speck in this dish. You can make the confit legs up to 2 weeks in advance or buy them from D’Artagnan and use any extras to make duck ragù. Place the turnips in a 2-gallon ceramic jar. In a mixing bowl, stir together the water, vinegar, sugar, salt and crushed grapes and pour over turnips. Cover and refrigerate for 48 hours. In a 12 to 14-inch sauté pan, heat the olive oil until smoking over medium heat. Add onions and garlic and cook until softened, about 8 minutes. Add flour and caraway and stir through. Drain turnips and add to pan. Cook until very soft, careful not to break the turnips, about 1 hour. Transfer brovada to a bowl, cover tightly and set aside. ½ pound speck, whole (smoked prosciutto) cut into julienne strips. In a 14 inch sauté pan, heat olive oil until smoking, add and onions and speck and sweat until onions are translucent. Add cabbage and cook until tender, about 20 minutes to half hour. Season with salt and freshly ground black pepper to taste. Place cabbage in a bowl, tightly covered and set aside. 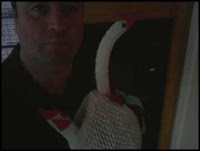 Separate the legs and breasts from the duck carcasses. Pull off the loose fat from the duck pieces and carcasses and set it aside. (Save the carcasses for stock). In a small bowl, combine the red pepper flakes and 1 tablespoon each of salt and pepper. Rub the legs all over with this mixture. Wrap the legs individually in plastic, and refrigerate them, the breasts, and the reserved duck fat overnight. In a small saucepan, combine the reserved duck fat and ¼ cup water and cook over low heat until the water has evaporated and the fat is liquefied, about 1 hour. Preheat the oven to 325°F. Place the duck legs in a shallow, non-reactive casserole and cover with the hot fat. Cover and bake for 2 hours. Remove from the oven and allow to cool. Keep the oven on (the legs may be stored in the refrigerator, covered in the fat, for up to 4 weeks. Remove the legs from the cooled fat and wipe off the excess fat with a paper towel. Season the breasts and legs well with salt and pepper. With a sharp paring knife, score the breasts on the skin side with an X, making sure to penetrate the duck's skin and fat but not the flesh. In a 12 to 14 inch ovenproof sauté pan, heat 1 tablespoon of the olive oil over high heat until smoking. Add the legs and sauté them, skin side down, until the skin is crispy. Remove the pan from the heat and place it in the oven to heat through, for about 5 minutes. In a second sauté pan of equal size, add 1 tablespoon of the olive oil. Add the seasoned breasts, skin side down and sear them over low heat for about 20 minutes, until crispy, draining the excess fat from the pan when necessary. Turn the breasts and cook on the flesh side until they are medium rare, or approximately 130°F on a meat thermometer. Transfer the beasts to a cutting board and allow them to rest for 5 minutes, and then slice them on a bias. To assemble the dish, divide the cabbage among four warmed dinner plates. Place duck leg on top of cabbage then fan duck breasts, skin side up over top. Top with brovada and serve immediately. Crab is good for you! A 3-½ ounce serving is 110 calories and just 1.2 grams of fat. 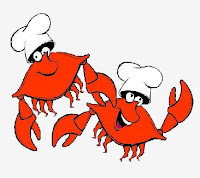 Crab is also an excellent source of chromium, which helps raise the levels of HDL (good cholesterol.) And, crab contains antioxidants and detoxifying substances. are closing in a stiffling economic environment, legislation was introduced by two Democratrepresentatives in California on Friday would ban the use of polystyrene foam and non-recyclable disposable foodservice containers by restaurant operators and retail food vendors statewide. In spite of the fact that it is cheaper to produce, and creates less of a carbon footprint to transport, Assembly Bill 1358, introduced by Reps. Jerry Hill, D-San Mateo, and Petro Nava, D-Santa Barbara, would Legislate the use of compostable containers in cities where organic waste is collected, as well as recyclable plastic or paper products made from post-consumer recycled material. More than 30 cities and counties in California have passed some form of a ban on the use of polystyrene foam takeout containers. Environmental groups argue that polystyrene foam is one of the leading sources of marine pollution and debris along California’s beaches. As introduced, the state legislation would leave local ordinances intact. Restaurant operators across the state oppose a statewide mandate, saying that alternative environmentally friendly options for foodservice ware are significantly more expensive. Many argue that passing the cost on to consumers is not an option at a time when guests are already bailing out so many other failed legislated mandates.